Soybean Cyst Nematode (SCN) is the number one contributor to yield loss in soybean crops nationwide, causing an estimated $1.2 billion dollars in damage annually [1,2]. This pest has been detected in 71 counties in Ohio, with the highest concentrations located in the northwestern part of the state where soils tend to be sandy in content. Significant yield reduction may take place with absolutely no above-ground symptoms. This is one of the main reasons one must sample fields for the presence and abundance of SCN. The quality of the diagnosis (and therefore, the effectiveness of management) is dependent on the method and timing of sampling. Check out our Submit a Sample page to see how to submit a soil sample for diagnosis. Emerging populations of SCN may have adapted to the resistance found in certain varieties of soybean, rendering the plant susceptible to infection. The good news is that these resistant varieties, while not 100% effective, are still providing a reasonable level of reducing or slowing SCN population development. For more information, download the fact sheet here. The cycle of the disease follows the life cycle of the nematode. There are three main life stages of SCN: egg, juvenile, and adult. In Ohio, it is possible to have 3 to 5 generations in one growing season, making timing of sampling important in obtaining correct SCN numbers. 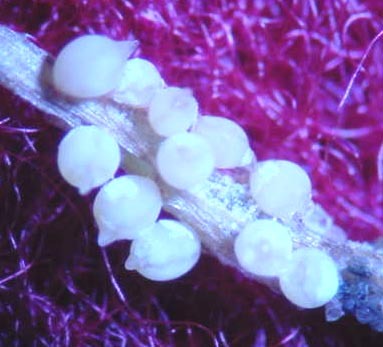 Eggs hatch as second-stage juveniles, or J2. 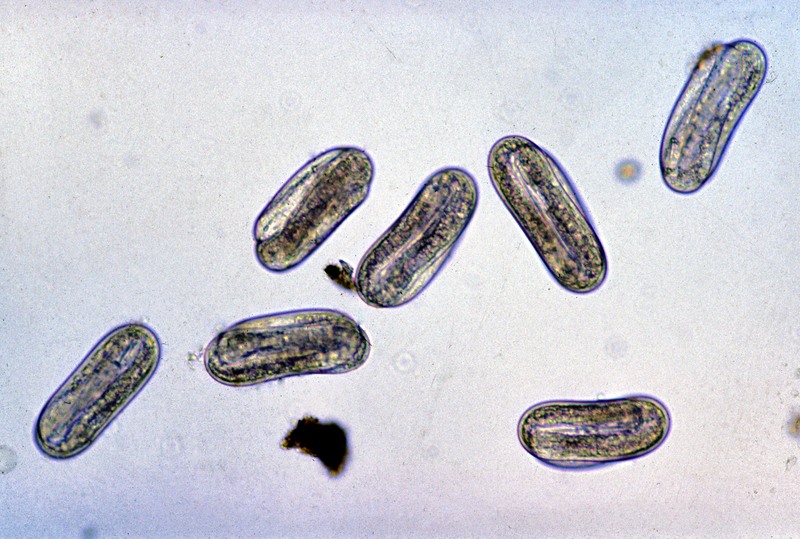 These motile roundworms have undergone their first molt inside the egg, emerging at about 1/64 inch long. The juveniles search for soybean roots, most likely using chemical indicators secreted by the soybean root. However, since the juveniles can move only a short distance through the soil before entering the root, they starve to death if no root is found. Water movement within the soil can help the juveniles move farther. Once a juvenile has found the soybean root, it will penetrate the epidermis and move to the vascular tissue where it will create a feeding site of enlarged cells called a syncytium. The females will become sedentary while the males remain motile. Once the female is fertilized by the male, it will essentially become an egg-making factory. The body of the female fills with eggs (several hundred of them) and swells, becoming too large to stay within the root tissue. The female bodies become the cysts visibile on the outside of the root. These cysts change color as the female ages from white to dark brown. Some eggs will be deposited from the cyst into a gelatinous matrix, where they may survive for a short period of time before hatching as juveniles. The cyst containing the remaining eggs may then break off of the root and survive in the soil for several years. As populations of SCN increase, plant symptoms such as chlorosis and necrosis may occur. However, they are not always apparent and yield reductions may still occur. Juveniles developing inside eggs. Photo courtesy of Dr. Terry Niblack, OSU. Young white cysts on soybean root. Photo courtesy of Dr. Terry Niblack, OSU. 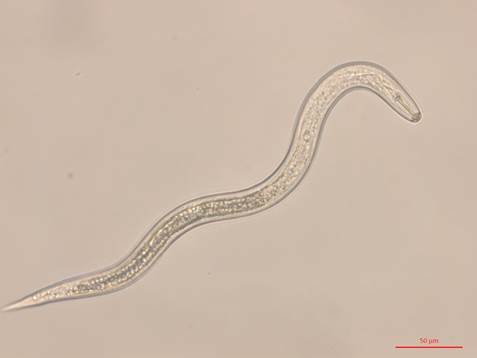 Motile soybean cyst nematode, notice the stylet, or the stiff, needle-like feeding structure used to pierce cells of the soybean root. Photo courtesy of Zak Ralston, OSU. 1. Koenning SR, Wrather JA. Suppression of soybean yield potential in the continental United States from plant diseases estimated from 2006 to 2009. Plant Health Prog. 2010. 2. Allen, TW, et. al. Soybean yield loss estimates due to diseases in the United States and Ontario, Canada, from 2010 to 2014. Plant Health Progress. 2017.